Not sure what to gift dad for Father's Day? Here are a few ideas: - Make your fave picture with dad into a poster. Take it one step further and frame or mount your print. - Can't choose which picture is your favorite? Turn it into a collage with our InstaCollage feature. - If you prefer to print at home, or you love supporting your local printer, we also offer poster quality downloads starting at just $7.99!!! If you're hosting a Father's Day event, like a luncheon, you may be interested double-sided flyers. You can upload images on one side, and on the other, you can list the location information, rsvp dates/emails, etc. We offer two different sizes, and they come in packs of 25, 100, or 1000 high quality postcard like paper! 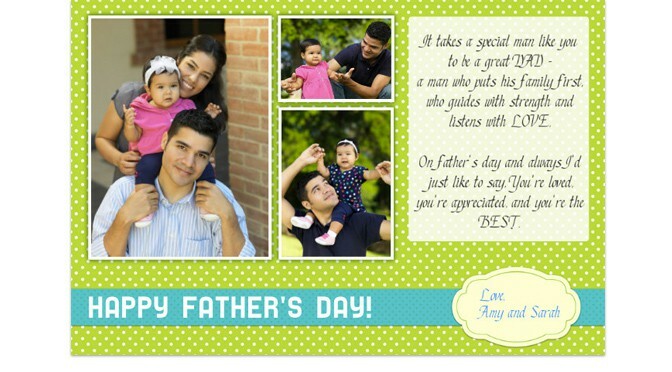 Select from our Father's Day templates gallery, pick and choose from our backgrounds or templates, or create your poster from scratch. Upload your own images, browse through our gallery of stock images, add fancy text - the possibilities to customize a fun and easy-to-make gift are endless! Go to PosterMyWall and start your poster today!!! Jun 1 Red, White & Blue - Flyers for Summer Specials, Too!